This is another small car park (no charge), with room for around a dozen cars (or one badly parked motorhome extravagantly towing a small car), that affords access to the Wall at Walltown Crags. It is located less than 1km east of the Roman Army Museum Carvoran. Heading north from the car park across the designated ‘access land’ brings the visitor to a fine stretch of curtain wall on Walltown Crags (1); one that has featured on many book covers. Walltown Turret (T45a) (2) can be inspected by heading slightly eastwards. A slightly longer walk eastwards reveals first an exposed yet not consolidated length of curtain wall and then the robbed-out site of Milecastle 45 (3), now just humps and bumps (to use the memorably contentious phrase of one former chairman of English Heritage). Further on, the visitor can witness how the course of the curtain wall (4, here a ruinous, grass-covered mound) deals tactically with the many ‘nicks’ or ‘gaps’, by means of a re-entrant. To the east, climbing Mucklebank Crags via the precipitous steps leads to Mucklebank Turret (T44b) (5). Two more re-entrants follow in the line of the curtain wall (6, 7) before the site of Allolee Milecastle (MC44) (8), again robbed out, are reached. To the west, the intrepid explorer can see the ditch (9) with its upcast mound beyond Walltown Quarry as well as a fine view to the west. Venturing downhill to see the tribal levy stone or Thirlwall Castle may seem like folly when there is Thirlwall View car park to exploit, but some may enjoy the challenge of the steep walk back afterwards. This tiny car park (no charge, room for 5 cars) lies midway between the village of Greenhead and the hamlet of Longbyre. It is intended to provide the motorist with parking for a visit to Thirlwall Castle but can also be used to explore neighbouring components of the Wall. Cross the road and follow the Pennine Way westwards onto the golf course to see part of the Vallum (1). 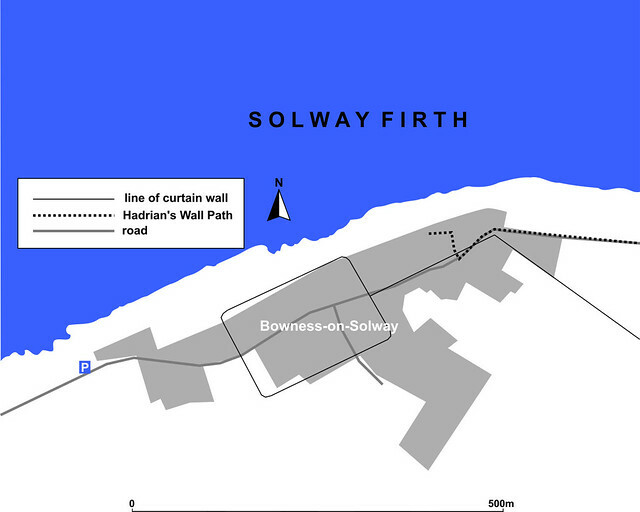 Alternatively, head north along the road to see a short length of curtain wall (2) perched on the top of the cutting. Heading north and then east and crossing the railway line brings one to Thirlwall Castle (3) with vague hints of the ditch (4) just visible in the field to the west. At Holmhead guest house there is a tribal corvee inscription (5). Venturing further westwards is rewarded with another fine length of ditch (6). albeit one that is abruptly truncated by medieval and later agricultural activity. To the east, a stiff climb up Greenhead Bank has the ditch to the right (7) and, near the site of Milecastle 46 (8), a fine view back across Gilsland towards Birdoswald and (on a good day) even further to the Solway Firth. You might prefer to drive to Walltown Quarry car park for a shorter walk to see these. Always be aware of the possibility of thieves operating in the car park. 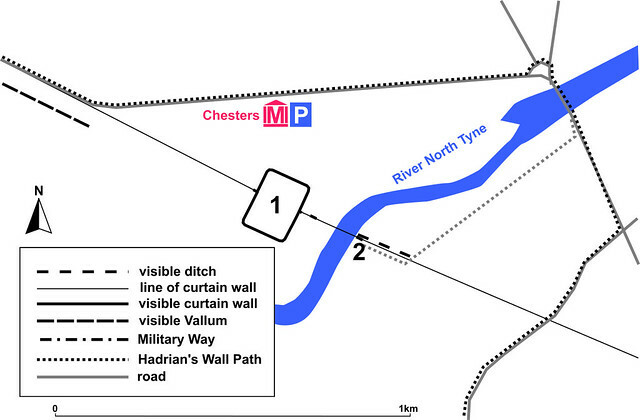 Follow signs for the Hadrian’s Wall Path to access sites to either side of Banks East. Stout footwear is advisable. There is currently no charge for parking. This small car park (with space for about nine cars) is immediately next to Banks East Turret (T51a) (1) and the short length of curtain wall on either side of it, whilst a fine length of ditch is visible on the northern side of the road. A short walk up the hill to the east brings the visitor to Pike Hill Signal Tower (2). Leahill Turret (T51b) (3) is displayed immediately to the north of the road and the ditch in front is clearly visible. To the west, Hare Hill curtain wall (4) falls within this zone. To the east, Piper Sike Turret (T51a) (5) is further along the road to Birdoswald and the ditch is again clear to the north of it, whilst the earthworks of the Vallum can be seen to the south. Continuing eastwards and then south along the Trail takes the visitor down to the line of the Vallum.